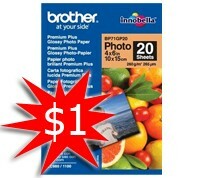 Brother Premium Plus Glossy Photo Paper - 4x6"
Low Price!!! Limited Stock Available! Cheap Photo Paper! Click Here Whilst Stock Lasts!